I was born to fight and began fighting upon my first breath. I was born in a hospital emergency room; fighting to live, and I fought in intensive care for months until it was safe to be taken home. Since then, I have been in many fights: from the streets of Tel Aviv, through a war in Lebanon, to my service with the YAMAM counter terror unit and more. All of these experiences reminded me to respect and appreciate life as a gift. I draw inspiration from the Latin word ‘spiritus’, which means ‘breath’, ‘soul’, and ‘vigor’ in English. This is to explain that martial arts involves much more than fighting other people. There is a great deal of depth in learning martial arts and such learning shouldn’t be rushed. You can’t be a swimming teacher the first time you fall into a pool! The more I teach Israeli martial arts, the more I wonder if anyone understands these arts or if it’s just a fashionable image. Israeli martial arts are not the best arts in every way. For example, Filipino martial arts have depth of knowledge in stick and knife fighting, thai boxing and karate focus more on impacting, whilst grappling and BJJ excel on the ground. So, what defines the Israeli systems? I recently designed a knife with FOX Knives called the ‘Israeli Tracker’. My inspiration for the design was based on the spirit of the knife as a practical tool for basic survival. A survival knife must excel at tasks such as cutting rope, building fires, building shelter and so much more. First and foremost, the knife is a life giving tool; yet most systems only show how evil the knife can be. Any fool can take a life, and even a child can fatally wield a blade. Further to the point, why not just use a stone? In order to prove this concept, I would like to teach a workshop called “Only Knife.” In this course students can use any knife they want. Immediately, they will have to think, “How will I survive, camp, and build a shelter with karambit?” The karambit is for sure the last knife I would choose for a special forces team. They need a tactical knife that can work and perform functional duties. At Avi Nardia Academy, we teach students to understand the knife as a whole, and not just as a killing tool. We also teach about the use of force and point out that what is taught in many knife classes will be considered murder by a court, and not as self defense. At my academy, we don’t fight because we hate the man in front of us. We fight to defend our friends and families behind us. The ultimate spirit of Israeli martial arts is understanding that you will never have another opportunity to defend yourself. We must use mind, body, and spirit in conjunction with techniques, principles of motion, and situational awareness. It’s not the better technique that wins the fight for your life, it is the spirit of determination to survive; the spirit of never giving up. 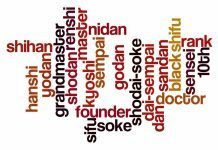 Recently, my Aiki Kenpo Jujutsu teacher, Hanshi Patrick McCarthy, spoke of the ancient Chinese maxim: “shin gi tai” (心技体) – Condition the body, cultivate the mind, nurture the spirit. Nowadays, many people only pursue the way of the body; mostly with the new wave of MMA. However, it’s often overlooked that most top MMA fighters have a background in one primary style such as jiu-jitsu, karate, or thai boxing; not just “MMA” as its own style. It is very important for new students to understand that. I have competed in a variety of contact martial arts, trained vale tudo fighters, and some of my friends and students (including UFC champion Carlos Newton) are world renowned in sport fighting. Thus, my words are based on experience. Sport fighting is a way to explore ourselves and our abilities, but it doesn’t teach us how to deal with losses in our daily lives, the deaths of people we love, or losses in business. Competitions are a small part of life, and a small fight when compared to standing face-to-face with something as dangerous as cancer, for example. Whereas sport is a fight for achievement, a personal battle is a fight for survival. Survival requires the ability to think in challenging situations, develop and maintain physical health, and training the ‘spirit’, itself. 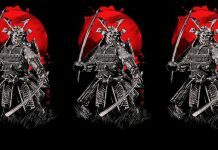 Sun Tzu pointed toward this idea when he wrote, “Know yourself and you win all battles.” This is the key to transcending from being a sport fighter into being a true warrior. During the past few years I have been involved in survival training projects in the arctic, desert and jungle. My academy holds training camps in the jungles of Thailand called ‘Warrior by Nature’ with meditations on nature itself. When you go into the jungle, the heat, humidity, flies, snakes, bees and other dangers constantly tempt you to give up. Everything there wants to kill you. This environmental stress, combined with long days of thai boxing, MMA and KAPAP Combatives creates an experience which challenges one’s mind, body and emotions. Training in these extreme conditions inspired me to reflect on how important mental fortitude is. Certain things catch your eye. But pursue only those that capture your heart. The wisdom behind those words gave me pause to reconsider the past, present, and future of KAPAP and Avi Nardia Academy. When I returned to Israel after 8 years studying martial arts abroad (mostly Japan), I was recruited back into the Israeli Army by Lt. Colonel Avi Harus (RIP) to create a new hand-to-hand system for Army special forces recruits. I had previously been a senior NCO and was by that time a field grade officer at the rank of Major. When I assessed their existing program, I found that the martial arts system they were practicing hadn’t been updated in more than 30 years. I developed a new hand to hand curriculum that was more practical, effective, and fit the mission of the school. 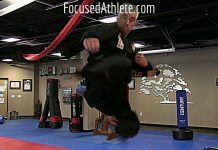 This program I developed here was the basis for what would later become one of the world’s most respected martial arts. When Israeli’s elite counter terror unit wanted to refresh their system, every CQB trainer in Israel applied for the prestigious position; including former operators. The unit is called the YAMAM and it is the special operations division of the Israeli national police; renowned as one of the most experienced and combat ready units in the world. All of the applications and proposals for this prestigious position were reviewed, and I got the job. As Sergeant Major of Command in the YAMAM, I worked with Lt. Colonel Chaim Peer, a highly respected man from the army’s top special forces unit (similar to Delta force in the USA). Lt. Col. 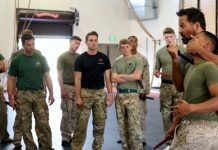 Peer brought great knowledge of unit needs and tactics, and with my knowledge of martial arts, we created a new close quarters battle system for one of the most elite combat operations units in the world. I named it KAPAP. KAPAP was a mostly forgotten WW2 era Hebrew acronym which means “Face to Face Combat.” I named the new system KAPAP in order to ensure our new system was distinguished from krav maga styles. For reference, ‘Krav Maga’ became the default name for military hand-to-hand from the late 1960’s onwards. When we first developed KAPAP we were specifically building a program for specialized unit of operatives. However, it wasn’t long until our new system was recognized as an extremely effective and cutting-edge combatives program. Even though our system was not originally intended for the general public or even martial artists, KAPAP quickly gained popularity and a strong reputation amongst the CQB community. Eventually, I moved outside of Israel and began sharing principles and methods for civilian and police defensive tactics. KAPAP continued to grow and during these last few years, I’ve been travelling non stop for teaching. 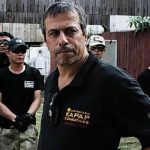 Now, I have a great team of instructors with KAPAP schools throughout the entire world. We have even taught KAPAP in Antarctica. In just 15 years, KAPAP has moved from being a system for a small group of operators to a worldwide, world class system for all. 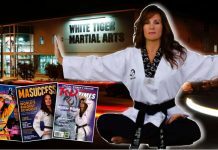 My primary focus is on continually growing and developing the quality of my instructors so that the same message, techniques and spirit can be learned in every school. In order to accomplish that, organization is essential. Following the encouragement of my friends and teachers, I built Avi Nardia Academy as my worldwide team of schools. 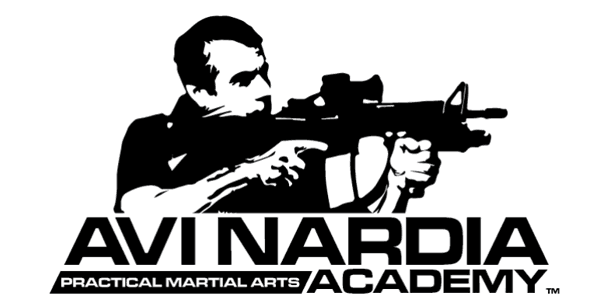 As I also carry black belts in Karate, Judo, Japanese Jujutsu, and Machado Brazilian Jiu Jitsu, Avi Nardia Academy is a school of practical martial arts that includes hand-to-hand, knife, stick, firearms, and everything in between. We teach traditional, sport and combatives under a single flag for anyone who wishes to learn and progress with only one major prerequisite: integrity. 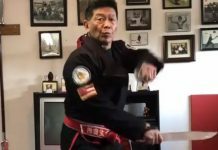 KAPAP is no longer just the “Martial Arts of the Israeli Special Forces.” I am honored to have a wonderful student aged 72 in my academy. This is an example of KAPAP as I see it progressing into the future. We need to support civilians; including women, children, seniors, and teenagers. I see my personal achievements in life very differently than I used to, and I now value teaching handicapped children in a disabled centre as more important than teaching special forces. I teach from the heart and as a warrior. My ethos is centered on truth, love, and peace. I encourage my students to be compassionate, without being vulnerable. The interesting thing about people, whether they are physically strong or weak, is that we can all choose to be kind, respectful and peaceful even if we were born to fight.